Gold Seal Engineering Products Ltd.
Technical license agreement with Saiag Industrial S.p.A., Italy, in manufacturing of new generation sealing profiles and glass run channels. Two joint ventures. Non-capital changes by using world-class manufacturing (WCM) methods such as single minute exchange of die (SMED), 5S activities (Sort – Straighten – Sweep – Standardize – Self-discipline), variations of the Kamban system and other recognized methods of generating productivity gains. A number of space and time utilization improvements were achieved. Shop-floor organization included leveling and repainting, with the additional benefit of improved safety and material flow on the shop floor. A 45% gain in production space was due largely to 5S activities. These activities combined with a red-tag campaign also contributed to a reduction in machine down time by 60%. Another contribution in this respect came from a systemic analysis of machine down time at each workstation, followed by remedy-search sessions held in the Engineering Department. 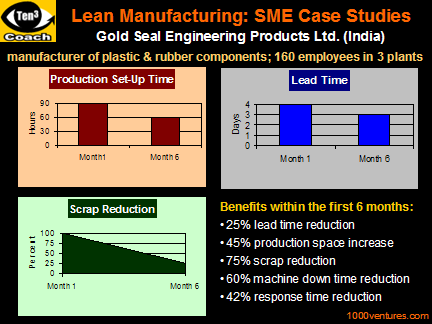 Production set-up time was reduced by 33% by the application of single minute exchange of die (SMED) method. Gold Seal engineers participated in a training program which focused on standardization of changeover procedures and streamlining internal operations. Subsequently, standard operating procedures (SOPs) were expanded to include manual work. Consequently, approximately 50% of the production processes performed on the company's shop floor were standardized. This led to reduction of the lead time required for production and completion of goods by 25%. Through training, workers were able to develop additional skills, which led to an increase in workforce flexibility. Skills matrix was developed for each department. The outcome of such as exercise revealed that 57% of the workforce at Gold Seal was multi-skilled. Takt-time leveling benefits were analysed in order to move towards a single-flow production system. A dramatic mindset change. A prevailing "culture of blame" was replaced by a more → productive Kaizen climate. A major contribution came from a female executive who exhibited a high level of → motivation and ensured that the activities agreed upon were properly carried out. Quality circles (QCs) were established and they increasingly involved the workforce. A suggestion system was also introduced, with suggestions being reviewed twice a month. These mechanisms combined with SOPs for manual work, and the utilization of new measuring devices had a significant impact on product quality. Scrap volume was reduced by 75%.